Here is Slovaltine Clue, number five. There is a LOST-related answer hidden in the image. Feel free to discuss it in the comments, but if you think you have the answer send an email to slovaltine@lostargs.com. Notice something strange about the Dharma Logos? Flipin' sweet, you're almost there. sayidsgirl - I left you a note in the other post. Cool! I don't have to work on it right now either (but I did, a little :) -- have fun and 'till later! Looks like another learning experience. . . might as well try something, right? Yay this is my favorite clue so far. Its really clever actually. I came up with the idea, but Dennis really made it look pro. You've gotta tell me how you make images like this someday - I'm afraid all I have is Paint. just tell me i dont need PS to figure this one out, lol. in the args i just wait for people with PS to do the ones that require it. the picture behind looks like an aztec sun stone- do you think thats relevant or not? I thought it was a Mayan calendar - - which has led to some really interesting reading that got me distracted from the puzzle actually. :) Aztec sunstone, huh - more reading I guess. . .
don't know- just guessing; ill have a look at your mayan calendar then, lol. Even if I don't get these things, I truly appreciate all your hard work, Dennis and Nick, to keep us amused! Aztec chessboard? Yeah, I got nuttin'! BTW, Photoshop is not required. 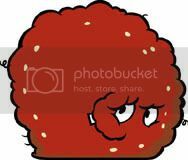 Meatball - absolutely no photoshopping is necessary for this clue - it is, for the most part, logic based. I agree about the photoshop thing, I prefer clever clues sometimes over ones where you can only see the answer if you adapt the contrast or something. mayan calendar and aztec sunstone seem to be similar things; no idea though still how or if this even relates. any ideas? Maya Chess seems to be a font? Wonder if that's significant. a little google told me it can also be called a Cuauhxicalli Eagle Bowl. jsyk. There are 64 squares when you lay out the hexgrams of the Iching. . .fwiw. . .
And we do have little ichings for chess pieces. . .sorta. "an altar-like stone vessel used by the Aztecs to contain human hearts extracted in sacrificial ceremonies." lol @ nick...that's wikipedia for you. has someone already found this? yeah, i was just seeing if there had been any sneaky changes made. Cool find, meatball. Wonder why the words "Mah Jong" is in that url? This image has nothing to do with Mah Jongg (I play twice a week)! Could it be some sort of grille cipher? i just came across the same thing, orb. @meatball, I'm looking at trellis ciphers on wiki but I don't fully understand it. well, we know from the start that the aztec-thing is negligible..
cuz nick said "I came up with the idea, but Dennis really made it look pro. 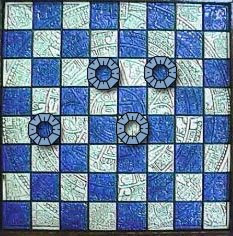 You've gotta tell me how you make images like this someday"
I was wondering if it's a chessboard cipher and the mayan calendar in the background is supposed to give us some sort of clue as to how to lay out the letters or number. . .with the four placed pieces being the 'grille'. . . Sorry - you guys already said that. . .I forgot to update. @for i quit soon, maybe he meant putting the dwy symbols on the board. @Lost 2010: Well there doesn't seem to be anything else to suggest how to put in the numbers/letters so that sounds like good thinking to me. Although Nick did mention logic, so it could be just a matter of arranging the numbers/letters in a certain logical way. on the contrary, i think its the dwy symbol that actually have some meaning..
Could the squares represent letters from previous clue answers? Like, each donkey wheel shows the beginning of a new word? no i wasn't saying they had no meaning, i just meant that maybe that's what he meant by saying making it look pro. point being, i dont think we should call any of it negligible. Can someone fix the solution buttons for Parts #1-#3. Pushing them reveals the answer to #4 only. And I would like to see the answers to the other ones. @blue heron--if you click on the post title, the clicks work within the individual pages. happened to me, too! If you pick up the four numbers that would give you for the four ichings I get - - 4, 59, 16, 2 - from the Wiki entry. . . But I don't know anything to do with those. . .
but right now, i'm a bit concern about the accurate placing of the 4 dwy symbols..hmm..
blueheron13 said... Can someone fix the solution buttons for Parts #1-#3. Pushing them reveals the answer to #4 only. And I would like to see the answers to the other ones. I think the background is an aztec calendar. The image is not very clear but sure looks like one (cant believe being spanish actually helped on this one!!). If that is the case the pieces will have a nº (date) associated to them and maybe thats what we need to translate ito a answer...¿? sounds good ANM; so how are these numbers/dates assigned if that is the case? Yep definetly the aztec calendar or "Sun stone" discovered in mexico on Dec. 19th 1760. If anyone else thinks it is eevant I have a dyagram of it with the explanation of each element but its in spanish so I gotta translate it! already looked into it, the dates start assignment with that faint inner circle with little pictures of animals on it. this is actually a picture of a chess board, so i don't think (and don't know if) we need to try and assign dates to the squares. i feel like we're overcomplicating...or at least i feel like i am. ANM - Do those spots where the pieces are mean anything special? See, I keep coming to that being a calendar and the aztecs/mayans reportedly predicting the end of time. . .and the end of lost will be in 2010. . .Any dates on there hook up to that train of thought? yeah; i am thinking it is irrelevant due to the image we found earlier of the chessboard (see above) but seeings as i can't seem to get anywhere down any road at the moment i'm not completely discounting it. It looks like a damn curling game!! grr...i thought i had cracked it and had gotten four letters of a lost character's name...then the last letter didn't fit...boo. 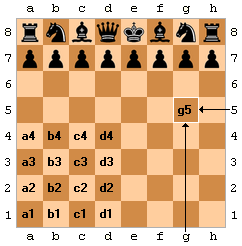 If you rotate the chessboard 90 degrees and put in the alphabest repeating over and over, you get a four letter string that begins with L and ends with T but o and s aren't the ones in the middle. LOL - I'm not sure if we're underthinking it or overthinking it. just like the nº of squares on each side...coincidence or clue? I never even noticed the solutions. I'm so observant. Ok Cule #1 still don't get. Clue #2 the first thing I did was lol and then say "I hate you Dennis." cause it was so simple. Clue # 3 My eyes see pixels behind all of the letters. I couldn't distinguish a difference. There was a pattern but I didn't notice that only some of the letters had pixels. And # 5 intrigues me but I don't think I'm going to be able to solve it either. Ah well it was fun watching you guys do it though. Hey does anyone here know Mandarin? I'm trying to translate a painting and only have 1 of 3 characters down. Don't the squares on a chessboard have names and numbers? Like I know I've heard people say stuff like Knight to B12 or something. . .
Meatball said... http://www.the2chessmen.com/Chess%20Mah%20Jong/Blue%20&%20White%20Chess%20Board.jpg has someone already found this? Good find :) That's the original I used to make the clue. Hint #1: You can ignore the Aztec pattern. @emerald...you are right, how embarassig, cant even count anymore!! oh good. we can ignore the aztec pattern. thats one thing out the way, lol; how much time did we waste on that?! Sayid'sgirl said... I never even noticed the solutions. I'm so observant. Don't feel bad... I just put them up this morning. ok, looked at the grille cipher wiki page. If this is one such cipher we need to figue ot what letters fill the grilland the pieces mark the position of the "openings". In other words we would get a 4 lettered anagram. yeah, i like the d6 etc. idea. I know the second character is li (4th tone) meaning strength. As for the other two though, I ain't got no clue cept 1 has what looks like jade in it (but not), and 3 has part that looks like yue?!!? OH!!!! !WHAT IF we use THE NUMBERS!!?? ?10 in six groups....but it might work! But I've been on and off or her since I took my daughter to school this morning. I tend to open the comments and not check the main page. Has anyone else noticed that the dharma symbols are a mirror image of what they should be? just did right before you posted it, good call. since Im looking up the japanese symbol the rading is different! @alice; i noticed that too but i couldn't think what significance could be behind it, lol. well im now working with it flipped in paint. trying to figure out a way to make 4-5 letters out of the damn thing. I wonder if it's two steps. . .as in we have to turn it into numbers and then into letters from there. Has that guy in lostpedia chat that always finishes in like 15 minutes got this one yet? Just curious. . .I like to know exactly how clueless to feel. . .
yea..at first, i quickly thought chess! but then again, the pieace are all the same..so naah..checkers! nope, one is on white. @for_i_quit_soon: nick said something in one of the other clues comments about a 'chess related clue' that he was working on, so i think its safe to assume its chess. Lost 2010 - only one person to my knowledge has so far got this one. She's never played an ARG before she says in her email, which surprised me considering she her speed at working it out. I guess some people are just natural code-breakers. Anon - yeah another person has confirmed that the first two make "wind power"
I was just reaserching chess and realized this is the main theme of Through the Looking Glass. Could explain the mirror image of the dharma symbols. Am I totally LOST here, I don't the wind power talk? Don't get the wind power talk. @alice; thats interesting; i think there must be something in this reflection thing, personally. email...thanks Dennis & Nick...great diversion!! Sent you my take on the last character...Hope you figure it out! Now how about another hint on this puzzle? Disregard the wind power talk. We were just translating mandarin for nickb123! Nothing to do with this puzzle! Hoku - that would be a logical guess. Im back,so nickb, you got all the characters translated? ABout where you guys are going..maybe flip the image, figure out the pieces coordinates...and somehow translate into a word? having flipped the image I get 3C 3E and 5D 5G. the 5D piece is the on over light blue...anyone makes sense of this? nick - thanks. That lets me know it's solvable. I'll try again later tonight. ANM - 3C 3E 5G - those are battleship positions too I think. CEDG are music notes too. . .
ANM - No I haven't got the last character down yet. The theory so far is "big ear" lol - if you could figure it out that'd be awesome. Meatball - I never said it WAS battleship reference codes, but its pointed you in the right area away from Aztec bowls lol. LMAO that is what I got earlier!!! @nickb the ast symbol means money, wealth,riches, fortune, assets....so maybe a wind power station/central¿? BTW may I ask why you are trying to translate these symbols? what about the space between the pieces and between the pieces and the edge of the board?? changing nº nto letters we get ccceeedg...not an anagram I think! ANM - I'm not sure the last character is the one you're thinking. That is "de" 时 isn't it? Assuming that coordinates are the way forward here, I'm wondering how to correctly label the grid. The chess boards I have seen have the letters going from left to right and the numbers going from bottom to top but that's not to say that is correct. There's also the question of whether to flip the image. That would give us a whole new set of coordinates. @ANM: Ah yes, I see now. How did you get the numbers 12 11 16 8 (N E S W)? @orb,I did it numbering the grill like a Fleissner grillelook it up in wiki, very usefull page on grille ciphers). BTW, where is everyone?? ?Gven up to prepare for the Project¿¿¿???? Where Im at its 19-08 already!!!!!! @ANM: Scrap my above question above - I can see how you got 12 11 16 8 now. So, I'll give you guys a little hint before I post up the next one. You all are really close - you have discovered two very important parts of the clue, and you just need to put them together. Can I get an opinion? Since I'm really bad at puzzles. If the image is a flipped chess board and using the numbers 8-1 on the side and the letters a-h on the bottom. The numbers would stay the same but the letters would be inverted. Backwards. So what used to be an a is now an h.
Is that a good assumption? Am I making since? If anyone figures it out let me know!!!! We're being left behind! Please don't put the answer up yet Dennis. Two parts? The first one must be the coordinates. Is the second the grille? You're trying to flip the McDonalds, instead of the burgers. I think I've probably complicated it by doing this but wanted to cover all bases. how did you get those steff?? @hoku lol, really? ?Thats amazing, I thought I was all alone out there in the darkness of incomprehension!? @steff whoa!lines 6 and 4??how?what? The chess boards on google images have the numbers labelled from bottom to top. Did everyone note Dennis' comment before? I understand what he meant but now I'm stuck again. Feeling very slow today! let's do it from the beginning. from Dennis: You're trying to flip the McDonalds, instead of the burgers. and the 2nd?the N E S W thing? Flipping McDonalds instead of the hamburgers means that we do not need to flip the whole image! So here's what I've got: either A4C6D4E6 or A5C3D5E3, (depending on whether the numbers are labelled from bottom or top). and what about flip colours?? is there some clue in colours? is it important? aaaah I feel we are so close! I'm here. Did you flip the burgers? we have to make it now! dennis said that we are on right way! what is the meaning of the battleship? @orb how did you flip t exactly?top/bottom only, left/right?? Obviously you know my feeling on the first clue, but I have to say that third clue was kind of bad. The answer isn't even a "real" character name. More heresay than anything else. When you do something like that, it just makes it frustrating. It must be Hex, but we don't have the right coordinates? Battleship was to lead us to use coordinates. what? ?forget the battleship?so forget coordinates or the whole /blck rock-freigter thing?? how come clues make it even more confusing? but we have coordinates, don´t we? @ANM: The burgers (lol) are the wrong way round. Flip them over, left, to make the images look correct. Think that's right and hope it makes sense. This gives you new coordinates. What I have to do next, I have no idea. so the right trak reffers to the black rock/freigter and we are lookin for hex? so is it all turning about blackrock and so on?? @orb flipping the whole image to the leftright gives the same result!! Could Dennis mean flip upwards instead of sideways? ANM, flip the McDonalds upwards instead of sideways? No, the "burgers" are only mirrored sideways. @ANM I think what Dennis is trying to say is to flip the Dharma logos over so that they are placed in the box to their left. But he did refer to EmeraldIsLost - ukgirl and steff and they both mentioned D6F6B4E4 which is flipping the whole image. ok, on th same page as steff on the coordinates C6 E6 D4 G4. I'm pretty sure it's hex. It's 1am here gonna have to go soon. I've got it! At least I think I have. Now I can go to sleep. All that flipping threw me right off actually! would this page have anything to do with it? ok, 2:30 here...off to sleep.